I've tried all the suggested ways to keep cut apples from turning brown--from squeezing lemon (orange, lime) juice on them, pouring lemon-lime soda on them, or storing them in a non-clear plastic container immediately after squeezing lemon juice on them. Nothing worked well, or at least, consistently. I got this tip from my hubby's cousin who says they use this method at her school. 1) Start with fresh apples. If your apples are old, it won't turn completely brown, but it will still show a tinge of color. 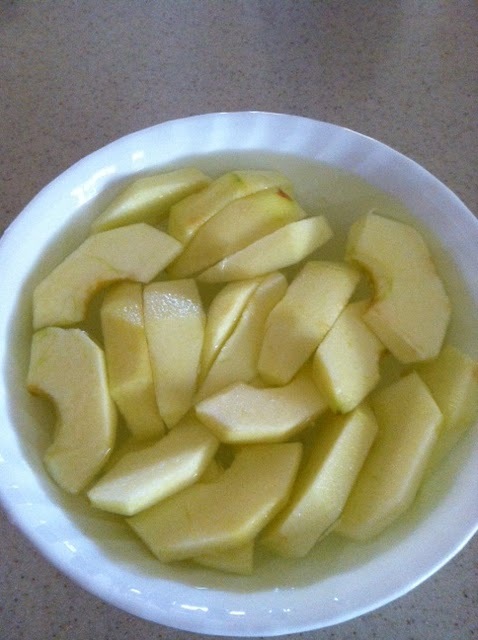 2) Soak cut apples in salt water for a 3-5 minutes. Don't soak too long or apples will taste salty. 4) Apples will remain a pretty color for hours!